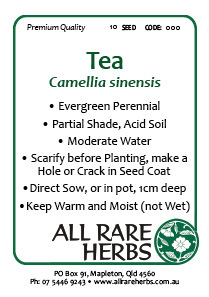 Tea, Camellia sinensis, is also known as Green Tea, Black Tea, White Tea and China Tea. The young green leaves are the source of green tea, and when fermented the leaves make the beverage known as black tea. A cup of tea is a stimulating and satisfying nervine. Tea is native to China and India and prefers warm temperate climates and light humus rich soils in an open, sunny position. May easily be cultivated as a hedge. Drought and frost tender. A evergreen tree, growing to 15m x 4m. Be the first to review “Tea, seed” Click here to cancel reply.